View More In Hex Keys. From electronics and kitchen appliances to small lawn and garden equipment, the TEKTON 10-Piece T-Handle Hex Key Wrench Set is perfect for benchtop repairs and assembly. The T-handle design offers complete comfort while applying more torque to fastener. Made from high quality carbon steel, these wrenches are heat treated for dependable performance. 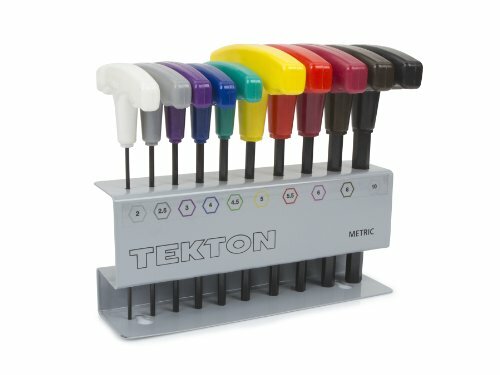 Color-coded handles, neatly stored in metal index stand, make it quick and easy to choose the right size. Index stand can be mounted to wall or workbench to keep your wrenches in one place. And, don’t worry, it’s backed by the TEKTON lifetime replacement guarantee. So, go ahead, Take It On.